On the twelfth night after Christmas, January 6th, the Feast of the Epiphany begins. In the Christian faith, it’s supposed to celebrate the coming of the 3 Wise Men/Kings to the Christ Child and the bringing of gifts to honor him. It’s also supposed to mark the beginning of the Mardi Gras season that lasts until Fat Tuesday, which is always 47 days before Easter Sunday. Although you may not be able to celebrate with the folks down south in N’Awlins at Mardi Gras, you can still celebrate in your own kitchen with traditional Cajun/Creole foods that are typically eaten at this time of year. Muffaletta sandwiches. Catfish. Shrimp n’ Grits. Beignets. There’s a chain of bakeries in my hometown that sells to-DIE-for Packzi, the jelly, fruit or cream filled donuts. I make a pretty mean Jambalaya myself, and last week I shared a recipe for what I think is also a pretty mean Gumbo. (Which you guys absolutely should try for yourselves). This week, four days before Fat Tuesday itself, I thought I would share one more recipe that gets a lot of attention this time of year: the King Cake. The King Cake is a staple of Mardi Gras food. It hearkens to the Feast of the Epiphany and the 3 Kings who came to visit the Christ Child, who in the Christian faith was called the King of Jews. Kings come to visit the King, thus yielding the King Cake; pretty self-explanatory. For that reason, a small plastic baby figurine is even tucked into the bottom of the finished product; the person who has and finds the baby in their piece of King Cake is supposed to have good luck for rest of the year. Alright, now down to brass tacks. Although it’s called a ‘cake’ I would actually describe it in taste and texture as closer to a brioche style bread. It’s made with yeast in a very similar way to brioche and provided your dough is made right, the texture should be close to it as well; moist and buttery with a tender chew. Traditionally, King Cakes are filled and rolled up with a mixture of cinnamon, sugar and pecans. As you guys can see, mine…isn’t. Why? Well, two reasons. First, nuts are expensive and the old purse strings gave me the side-eye when I asked them about going out to get some. Second, I already had chocolate in the house and I’d say that a chocolate filled cake is just as tasty as one filled with nuts, right? Of course right. What do you guys think of the finished product? The topping I kept traditional; a powdered sugar icing sprinkled with green, purple and yellow sanding sugar, which are the typical colors of Mardi Gras. And I think it both looks and tastes pretty nice if I may say so myself, nuts or no nuts. One thing I will advise is that you follow the tip that I included in the recipe to help maintain the circle shape through the second rise and baking. If you have an oven-safe bowl (like the kind creme brulee or lava cakes are made in) it would be perfect to wrap the ring around and let it proof and bake that way. If you don’t, that’s fine too. Just mist a big ball of crumpled up aluminum foil with cooking spray and wrap the ring loosely around that. Loosen the cake from eiher the bowl or the foil shortly after it comes out of the oven; it’ll make for easier removal. And if you’re so inclined, feel free to slip a plastic baby figurine (or a bean, because who actually has one of those just sitting around) into a slit that you cut into the bottom of your FINISHED & BAKED loaf for that special person to find and get their extra bit of luck for the rest of the year. Aaaaand, that’s it. Laissez le bon temps rouler, y’all. Linking this up to Fiesta Friday #160, co-hosted this week by Anugya @ Indian Curry Shack and Margy @ La Petite Casserole. In the bowl of a standing mixer fitted with dough hook attachment, combine the warm water with the yeast. Sprinkle the 1 tsp white sugar on top & let sit for 10 minutes, until frothy. Meanwhile in a small bowl whisk together the sour cream (or buttermilk), vanilla extract, eggs and egg yolk. Mix into the yeast mixture and beat for about 1 minute. Turn the mixer off and add the flour (1 cup at a time), salt and remaining 1/3 cup sugar. Beat at medium-low speed until most of the dry ingredients have been absorbed. Turn the speed up to medium and add the butter in small chunks, beating until combined, about 2 minutes. Flour your hands and a clean surface (like a pastry mat or wax paper. Scrape the dough out and onto the surface (it’s fine if it’s a little sticky). Gently knead it about 5-6 times until it’s smooth and pliable. Spray the mixing bowl with cooking spray and punch down into the bottom. Flip over and punch down one more time. Cover with a piece of plastic wrap, then a damp kitchen towel. Allow to rise until doubled in size for about 90 minutes in a warm place (I usually use my microwave). Line a baking sheet with parchment paper and spray with cooking spray. Punch risen dough down onto floured surface and roll into a rectangle, about 17×16 inches. In a medium microwave safe bowl, combine the chopped chocolate and butter. Microwave in 30 second intervals until the chocolate is melted and smooth (don’t over-microwave or else chocolate will seize and be unusable; 60 seconds TOPS should do it). Stir in the baking cocoa or cocoa powder & warm milk. Spread in a thin layer over the rectangle of dough. Starting with one short side, roll dough into a log and pinch the seams thoroughly to seal. Gently lift and place on baking sheet and form a ring, pinching the ends together to seal. (You can use a ball of aluminum foil lightly sprayed with cooking spray or a small oven-safe bowl placed in the center of the ring, to help it maintain its shape). Cover with plastic wrap and damp kitchen towel and let rise until doubled in size, about 60 minutes. Preheat oven to 325°. Uncover cake. Use kitchen shears to make 7 (1/4 inch) deep cut into top of dough. Bake until golden brown, about 35 minutes & covering with foil if browning too quickly. Allow to cool completely on a wire rack. For icing, combine powdered sugar with vanilla extract & milk in a small bowl. (If too stiff, add 1 tsp milk until spreadable) Drizzle over top of cake with a fork. Sprinkle colored sanding sugar in alternating colors. Let stand until icing is set. I really like the addition of the sanding sugar. That looks good. 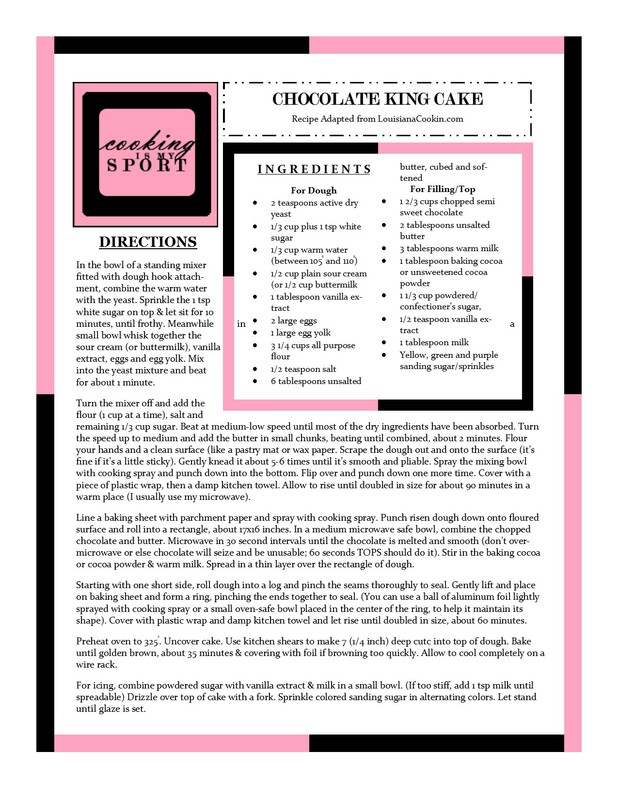 The chocolate punches up the flavor of kings cake. Thanks for sharing. You’re welcome, thank you for stopping by and commenting. The cake turned out rather nice, I think. Yum! Indulgence at its sweetest! Thanks! It IS for Fat Tuesday, so I’d say it’s appropriate lol, thanks! It looks so colorful and tasty! Gorgeous cake Jess and I LOVE that you added chocolate. I’ve never made king cake, don’t think I’ve even had it before. It looks a bit like a babka, beautiful and delicious. I’m getting ready to make my King Cake!! My family looks forward to it almost more than anything else I make. 🙂 I fill it with cinnamon-sugar. LOVE your chocolate version. It’s so pretty too! How awesome that you make it every year Josette, I bet your family DOES love it. Thank you! Jess, this is gorgeous and I’ve had King Cake from New Orleans and never been that impressed – but a chocolate version? Genius!!! Beautiful cake! I just made King Cake Scones from Louisiana Cookin… I love that magazine. This cake looks great. I love the bright colors! I like the idea of a Mardi Gras cake. Thank you, I’d been wanting to try to make a King Cake for a while now and I think this one turned out pretty well. Now, I’m seeing them on Pinterest. Yours was the first for me. I feel so behind. I’ve been working on St. Patty’s Day and didn’t look at the calendar! Mardi Gras is tomorrow. Now, I’m doing lenten dishes. You King Cake is absolutely gorgeous! I love the festive colored sprinkles and the perfect chocolate swirl inside the bread – yum! Being Italian Mardi Gras is something that I have always celebrated, it is a kind of Halloween for us. We have a very unique food tradition, mostly sweet, but nothing similar to your king cake! It looks delicious! Thanks for being at FF Jess! Beautiful and delicious-looking king cake you made!